Sew what's cooking with Joan! 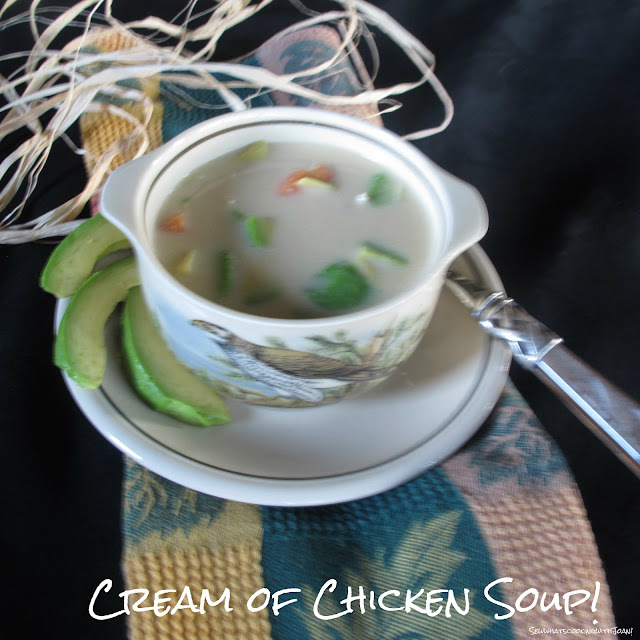 : Chicken Soup...the COLD remedy! 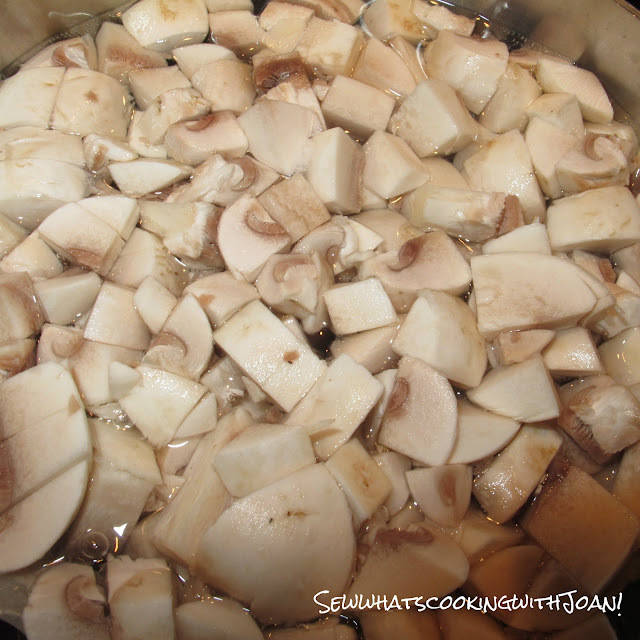 Poach mushrooms in 1/2 cup water, lemon salt and pepper for 3 minutes. Remove from heat and let them cool in the poaching liquid. 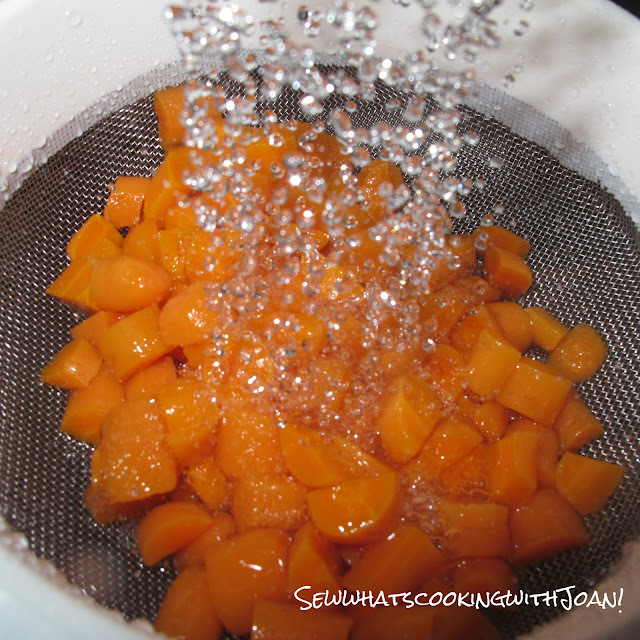 Cook the carrots in a small saucepan with the water to cover. Add 1/2 teaspoon of sugar, salt and pepper. Cook until tender, drain.....refresh under cold water, set aside. 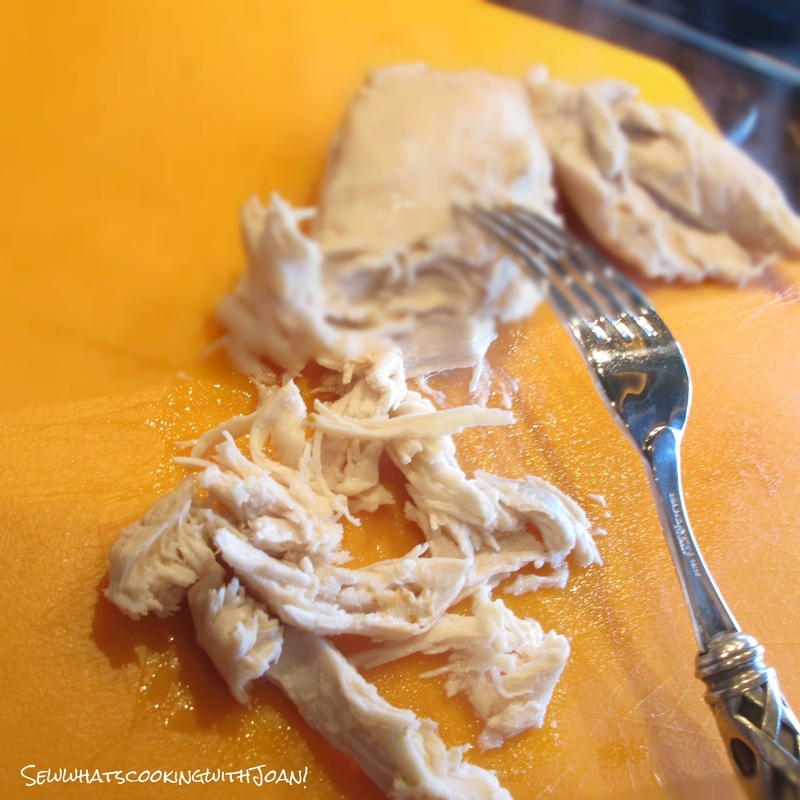 Cook the chicken breast in the chicken broth until done, about 10 minutes, depending on the thickness of the breast. Remove breast and shred with a fork. In a large saucepan, heat 4 tablespoons butter and cook the flour, without browning, for 2 minutes. Remove from heat and add a cup of broth, whisk, add another cup of broth, whisk...then put the remainder of the broth into the egg mixture. Return to heat until the mixture thickens a bit. 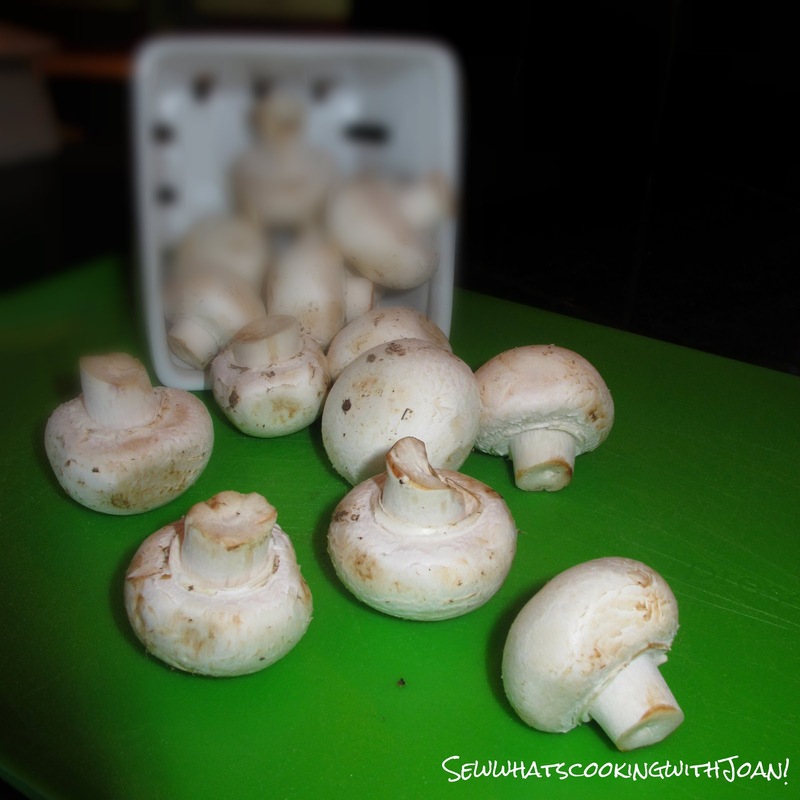 In a small bowl, combine the egg yolks and cream, then add mushrooms and their liquid. Add carrots and avocado and shredded chicken (if desired). Heat through without boiling. 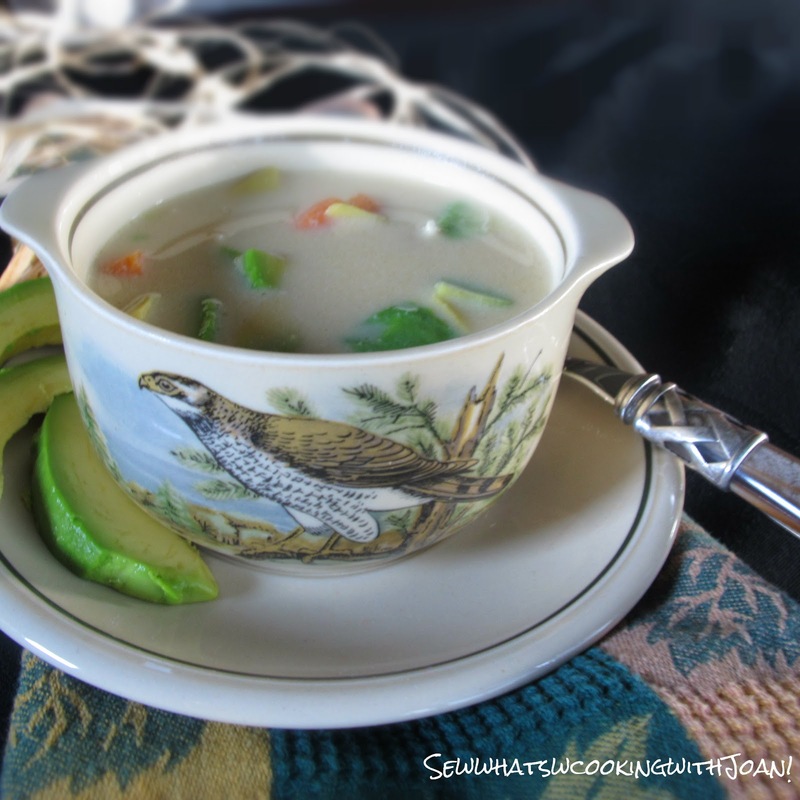 There’s nothing like making your own chicken soup. If you haven’t done it, I highly suggest you try it—you’ll never want to eat canned soup again. And my cold? It’s getting better. Yippee! I like to give this soup as a "Get Well Gift" to my friends who are sick. Everyone I have given this soup to, has sworn it cured them!! So, if you have a close friend who is not feeling well, this is the ticket! I put it in a clear glass jar with a ribbon or rafia tied on to it. They will love you for it!! 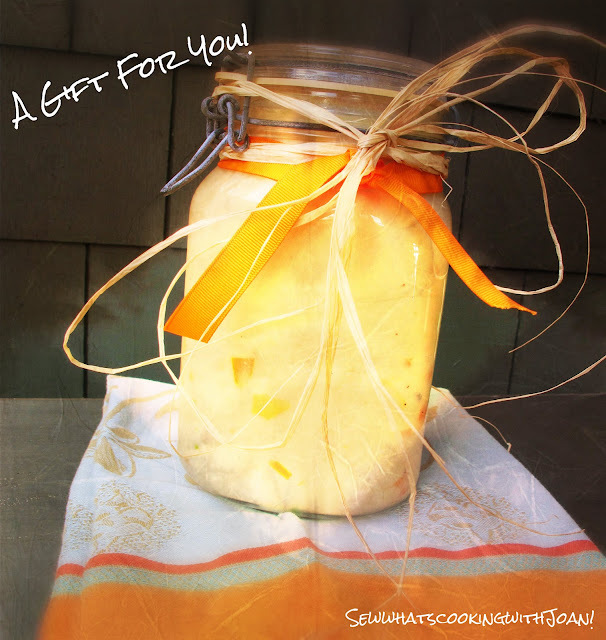 In fact, my friend Kris, returned my glass jar with her favorite soup!! I am having so much fun with my new hobby, film making!! Over the weekend we were celebrating our Granddaughter's first Birthday! Laura, my step daughter created the most amazing 1st Birthday I have ever attended!! She has a knack for all the details that go into making an event "over the top", with every detail accounted for. She has planned many family events, including showers, weddings and Birthday's. Here is the trailer I made to lead up to a movie to be produced soon! Enjoy! PS my private photography class to learn more about my camera settings, lighting etc. paid off. I am thrilled with my photography! Giggle giggle! We love the trailer! I'm so glad all the highlights of her party were captured and so well put-together. Thank you! I can't wait to show Julia the movie when she is older. Your pictures for this blog are fantastic..way to go! I would definitely say the photography class is paying off! I can't get enough of the trailer...have watched it half a dozen times. We loved being a part of Julia's 1st birthday! Would not have missed it for the world -love that girl! I am so glad everyone is enjoying the trailers. I will get after the movie soon!I am thrilled with my pictures! It is fun seeing how this blog has evolved from a lazy chaise lounge on the veranda of our cottage in Ocho Rios, with one expertly schooled woman wanting to keep her brain active and a adventurous, avid cook and baker.....currently we have 30,000 Twitter followers, almost 300 Goggle followers and countless FB friends and relatives. I get giddy when I learn something new and am able to apply it! It is fun! Pork Tenderloin with Port, mushroom sauce! Spiders, Pumpkins and Spooky Ghosts! 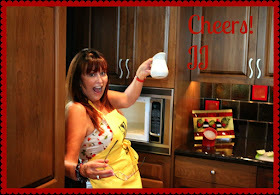 JJ's tips for hosting a dinner party at home!